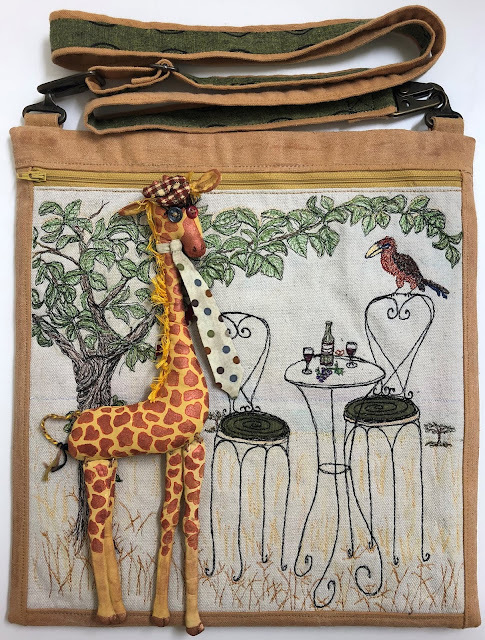 This giraffe doll, lovingly named High Brow, was initially featured in my UrbAnimals post on September 13, 2016. He hangs around on my display wall with other dolls and animals. After a recent suggestion to hang the dolls on bags, I started work on a bag specifically made for High Brow. Finished bag is 13-1/2" wide x 14" tall. At full length, the adjustable strap measures 57 inches, including hardware. This was not easy for me. 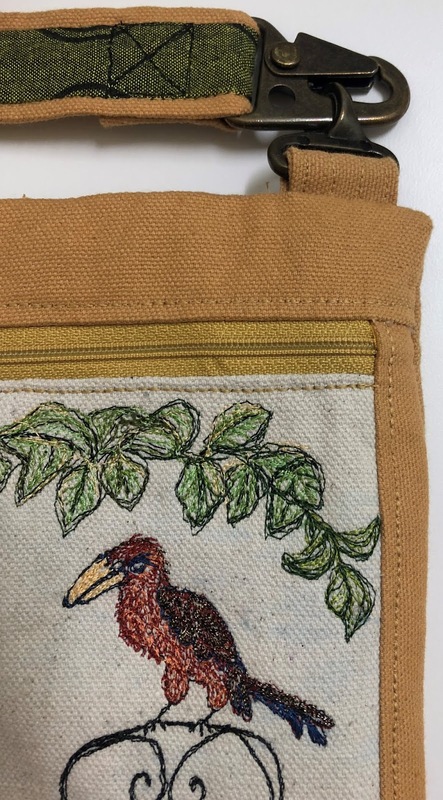 I enjoyed stitching the thread sketch and making the bag. But there was something about hanging a doll from the bag that just did not speak to me. This bag is the result of weeks of experimentation and anguish. Even now, after several false starts, there are things I would do differently next time. But, I've tried it, and I think I am over it. I will share a few notes here in case I change my mind. Rather than talk about the mechanics of the thread sketch or bag creation, I will focus, instead, on a couple new products that made this project more fun than it might have been. I have been using the same painters' 10 oz canvas for two years. It sews easily and takes the paint well, but the quality is uneven. After all, it was developed to protect floors and furnishings from paint.... not necessarily for art work. I was looking for an online supplier and came across Big Duck Canvas. They offer a large variety of heavy-duty fabrics. I purchased several yards of 10 oz canvas in three colors. The canvas is priced right and delivery was fast. I am very happy with the quality and selection. I had already started the thread sketch when the canvas arrived. 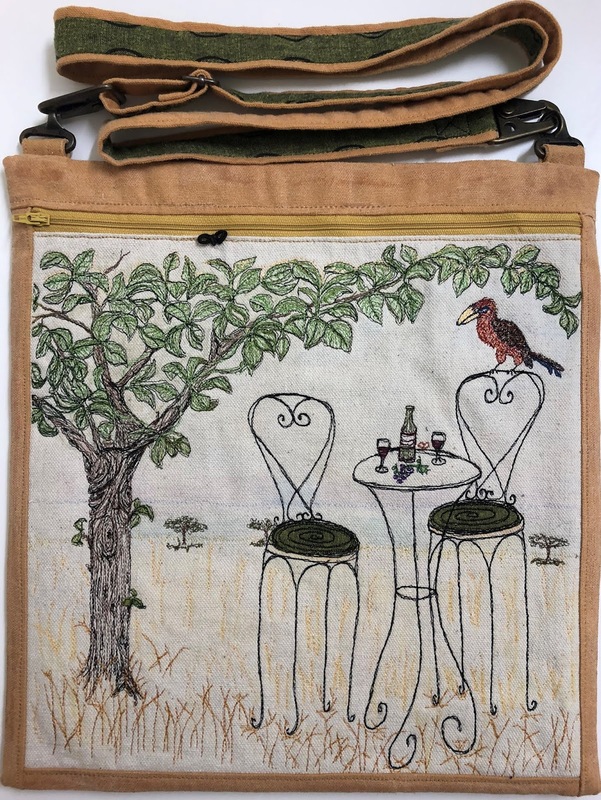 However, the body of this bag is made using their gold 10 oz duck cloth. I cannot report on how well it takes paint. I will try that next and share the experience in another post. I can, however, say that the Big Duck canvas worked better with another new product for me, Otter Wax. More on that later. Start, as usual, with a rough sketch. I took no photos of the thread sketch and bag creation. 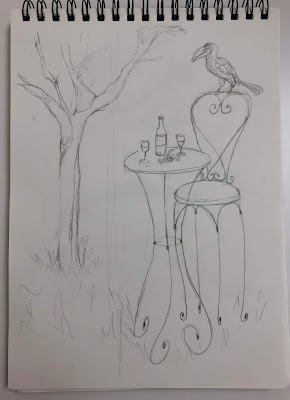 I used my typical process, and there are plenty of tutorials in previous posts if you want to explore how I create a thread sketch from a pencil drawing. 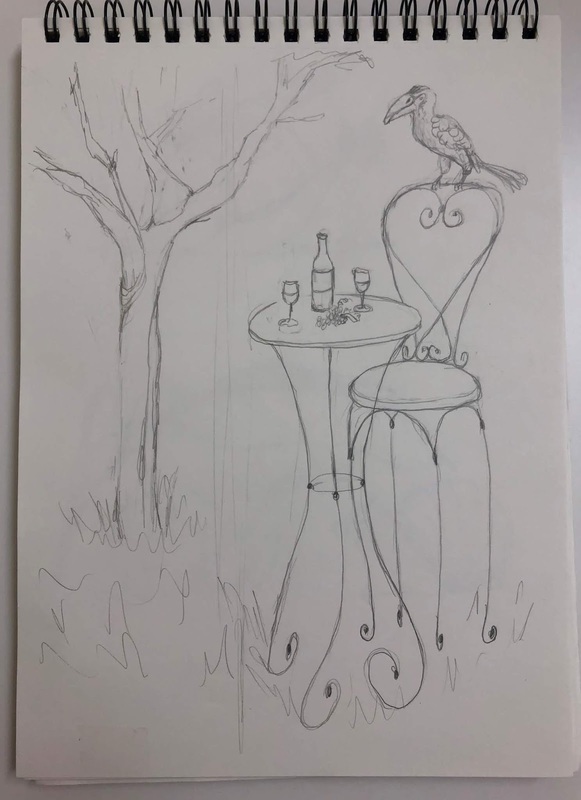 The original sketch had only one tall chair. I decided to add a second chair in case High Brow does not hang around for happy hour. 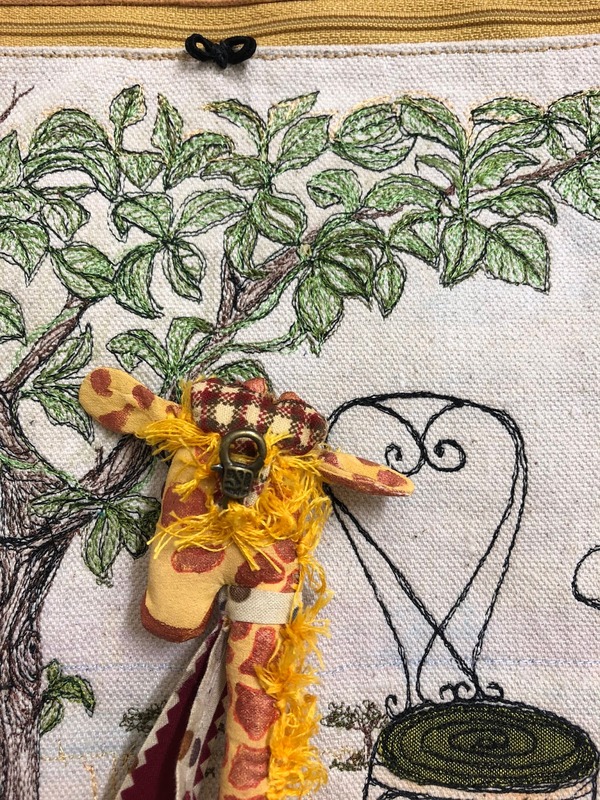 A tiny antique brass lobster clasp attached to the back of High Brow's head can be hooked to the small "butterfly" cords sewn between the thread sketch and the zipper. If I could do it over again, I would put the zipper on the back side of the bag above the pockets. This would devote an entire side to the thread sketch and give High Brow a little more room to dangle. 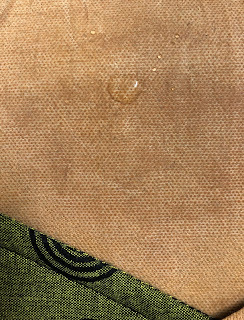 Here is a close look at the canvas before Otter Wax. Heavy duty antique brass hardware dresses up the bag. Patch pockets reduce bulk at the side seams. 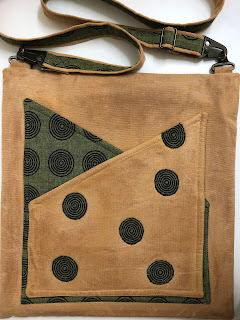 Using a variety of shapes and fabrics is an easy way to add utility and interest to the back side of the bag. These pictures were taken after I started applying the Otter Wax. 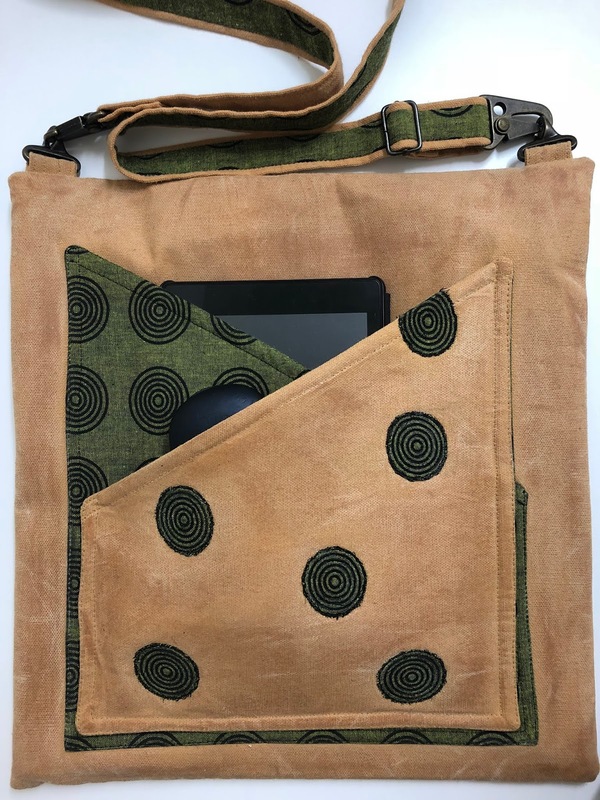 The photo on the right shows there are two pockets, one holding a Kindle Fire and the second holds a case for sunglasses. Heavy-weight stabilizer was used to pad these pockets making them a sturdy and safe place to store items. An inside pocket keeps small items close at hand. 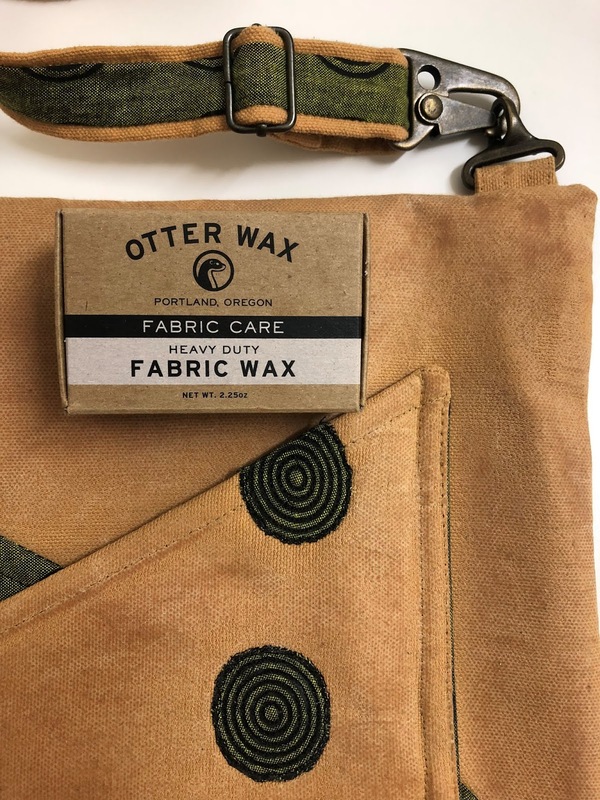 I am relatively new to Otter Wax. Earlier in the year, I waxed a few small bags made with the painters' 10 oz canvas and was not impressed with the outcome. But the higher quality duck cloth from Big Duck Canvas took the wax much better. 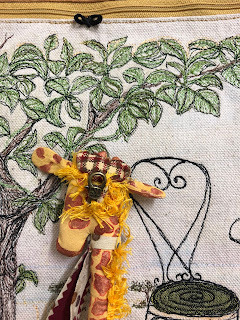 I probably could have applied the wax before cutting and sewing the bag together, but I was not sure if there would be buildup on the needle causing a problem with my machine. It takes a while to apply the wax and work it into the seams and around the edges of a finished bag. Honestly, working on the finished bag gives a more uneven and weathered look that appeals to me. In fact, after applying a coat of wax, I crunched and rolled the bag to create wrinkles, and applied another coat. There are many tutorials on how to apply Otter Wax. 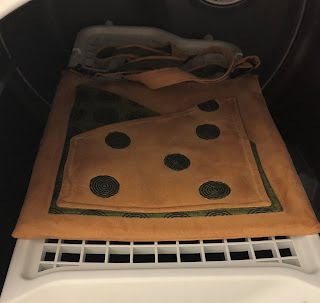 Some suggest using a pressing cloth over the wax fabric and iron to set the wax. I found that much of the wax transfers to the pressing cloth and it made a mess. Instead, I placed the waxed bag on the drying rack that came with my dryer. I set the heat on medium and let it go for about 15 minutes. I applied another coat of wax after that, and now will let it hang dry for about 24 hours. If there is any residue left after drying, I will return it to the dryer and give it a final rub with a clean cloth. I have found that Otter Wax sometimes darkens fabric and in the case of canvas, sometimes lightens the fabric. 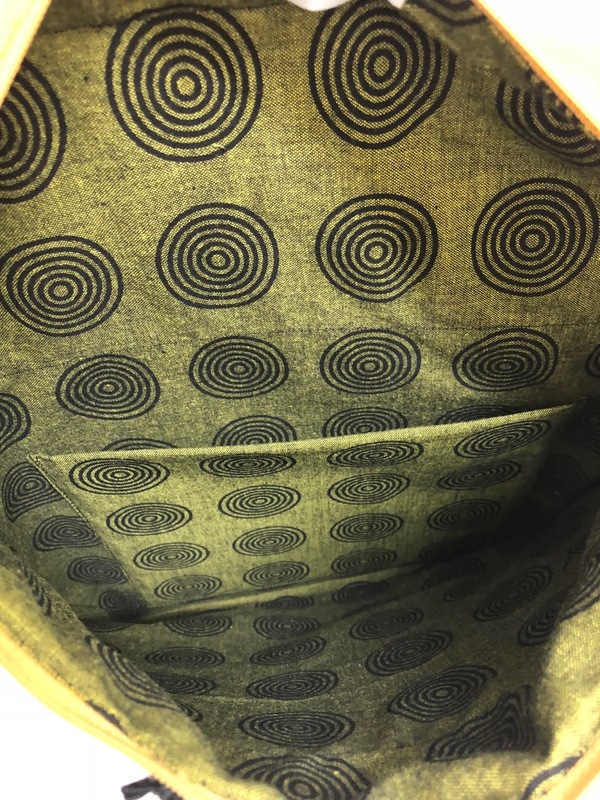 Always, always test on a piece of fabric before using on your finished project! Even though water is beading on the waxed canvas, I am not willing to say it is water proof. For me, the wax is more about the look and feel of the waxed canvas. While waiting for my machine to return from the shop for its annual physical, I completed several new sketches. 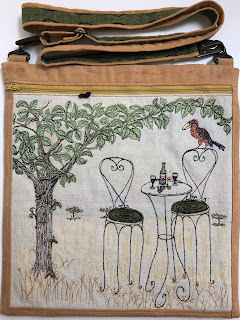 I am looking forward to making more small cross-body bags with new designs and new canvas. Thank you for visiting! I hope you will come back again soon.